What is the Ring of Trust? Read Below or click on the image above. Our goal is to bring a new standard of quality and customer service to the world of whip making. Wherever you see this logo, you can be confident that not only does the whip maker have very high personal standards, she/he is being backed up by a group of peers who have promised to hold them to the highest standards in quality and service. 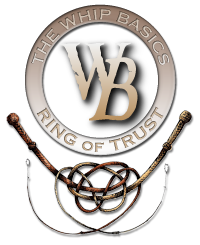 If you are not happy with a purchase from a "Ring of Trust" whipmaker you can guarantee it will be sorted out or a new whip will be made for you by a different "Ring of Trust" whipmaker.